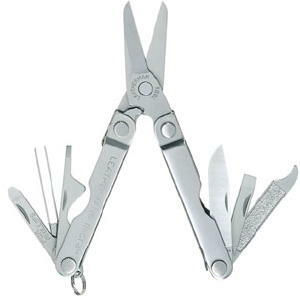 MICRA stainless steel pocket multi-purpose survival tool. 2-1/2" closed and weight is 1-3/4 ounces. No sheath. 25 year warranty. Multi-tool Handle 3/16 in. 1-1/2 in. Knife Blade 1/8 in. 5/8 in.